Q: After the United Nations (UN) Security Council's adoption of Resolution 2375, quite a few members of the UN Security Council all stressed on seeking political and diplomatic means to resolve the Korean Peninsula issue in their explanatory remarks. It is also reported that the ROK President Moon Jae-in, President Vladimir Putin of Russia, President Emmanuel Macron of France, German Chancellor Angela Merkel and other leaders in recent telephone conversations all advocated fundamentally settling the Korean Peninsula nuclear issue in a peaceful manner. What is China's comment on this? 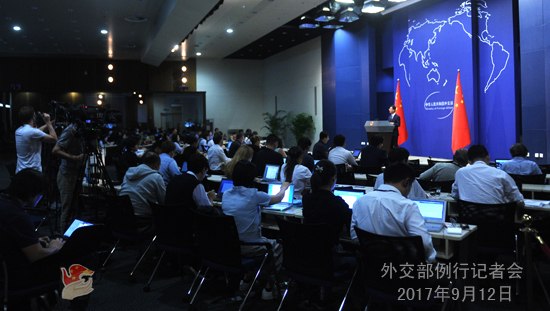 A: The Chinese side has noted the statements of relevant parties. The Chinese side is always committed to peacefully resolving the Korean Peninsula nuclear issue through dialogue and consultation. While taking further measures in response to the nuclear and missile programs of the DPRK and steadfastly upholding the international non-proliferation regime, the Resolution just adopted by the UN Security Council reaffirms the commitment to safeguarding the peace and stability of the Korean Peninsula and Northeast Asia, stresses on addressing the issue in a peaceful, diplomatic and political way and supports the resumption of the Six-Party Talks and the commitments under the September 19 Joint Statement. The Chinese side believes that all relevant parties should implement the relevant stipulations of the resolutions of the UN Security Council in a comprehensive and complete manner. Currently, the situation on the Peninsula is highly complex, sensitive and grave. All relevant parties should keep cool-headed and stay committed to resolving the issue peacefully through dialogue and consultation. 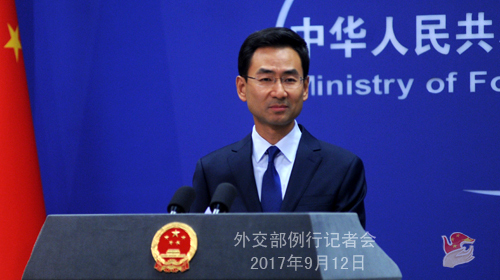 The Chinese side has all along made unremitting efforts to promote the proper settlement of the Korean Peninsula nuclear issue. 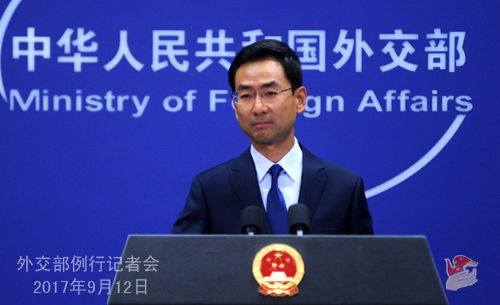 The "dual track approach" and "suspension for suspension" initiative are the proposals put forward by China to fundamentally resolve the Korean Peninsula issue in a peaceful manner in view of the current situation on the Peninsula and the legitimate concerns of all relevant parties. This approach and initiative, which can address both the symptoms and root causes, are reasonable and objective. We hope that the relevant parties can actively support the efforts made by China to promote peace talks and work with China to play a constructive role for the peaceful settlement of the Korean Peninsula issue. Q: The resolution adopted by the UN Security Council this time stipulates that it will set a limit for the crude oil exported to the DPRK according to the current level. Will China release the statistics of the crude oil later? A: The Chinese side implements the resolutions of the UN Security Council in a comprehensive and strict manner and will fulfill its due international obligations in accordance with the stipulations of relevant resolutions. Q: This DPRK-related resolution fails to implement the strictest oil embargo on the DPRK that some countries have called for. The previous sanctions have all failed. Does China believe that this latest resolution will work? A: Resolution 2375 of the UN Security Council is unanimously adopted on the basis of the thorough consultations of its members. It reflects the collective position of all relevant parties to advance the denuclearization process of the Korean Peninsula, uphold the international non-proliferation regime, safeguard the peace and stability of the Peninsula and stay committed to resolving relevant issues through dialogue and consultation. We have said many times that just imposing additional sanctions cannot fundamentally resolve the Korean Peninsula nuclear issue and dialogue and consultation serve the fundamental way out for the issue. Here I would like to stress once again that on one hand, Resolution 2375 imposes the new sanctions and firmly upholds the international non-proliferation regime and on the other hand, it also emphasizes the peaceful settlement of the Korean Peninsula nuclear issue through dialogue and consultation and calls for the resumption of the Six-Party Talks. We hope that Resolution 2375 can be implemented in a comprehensive and complete manner. 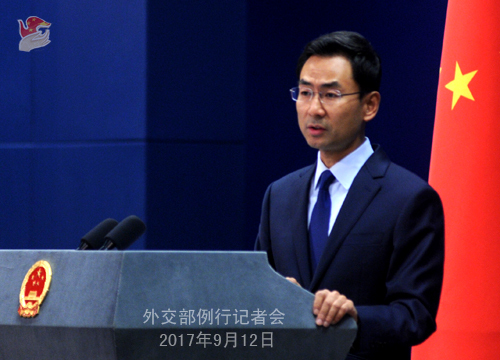 Q: First, it has been a while since India and China resolved the issue of Dong Lang standoff on August 28. Will China consider reopening the pilgrimage route via the Nathu-la pass in the Sikkim Sector for India pilgrims to go to Xi Zang? Second, China has not handed over relevant hydrological data to the Indian side apparently due to the standoff. As the relevant hydrological data are quite important in predicting the flood situation in the downstream, will China resume providing relevant hydrological data? A: As for your first question, for a long time, in the interests of China-India friendly relations, the Chinese side has made enormous efforts against all odds to facilitate officially-organized Indian pilgrims' trip to Xi Zang. In the light of the consensus reached between the leaders of China and India, and the fact that the Sikkim Sector of the China-India boundary has been delimited as recognized by both countries, the Chinese side approved the opening of the pilgrimage route via the Nathu-la pass in the Sikkim Sector of the China-India boundary for officially-organized Indian pilgrims in 2015. The arrangements ran well over the past two years. In June this year, due to the Indian border troops' illegal crossing of the China-India boundary in the Sikkim Sector into the Chinese territory, the situation of the border area became tense. Out of security concerns, the Chinese side put off arranging officially-organized Indian pilgrims to go to Xi Zang via the Nathu-la pass. The Chinese side attaches importance to the non-governmental contacts and people-to people and cultural exchanges between China and India and is willing to continue maintaining communication on the relevant matters concerning the officially-organized Indian pilgrims' visit to China. Regarding your second question, for a long time, the Chinese side has overcome all sorts of difficulties to conduct cooperation with the Indian side in such areas as the hydrological flood reporting of trans-border rivers. Last year, due to the needs for reconstruction after being damaged by the flood and out of such technological reasons as upgrading and renovation, the relevant hydrological stations in China do not have the conditions to collect relevant hydrological data now. As regards whether the providing of relevant hydrological data will be resumed, it depends on the progress of the above-mentioned work. Q: I want to know the effect of the new sanction on the DPRK's workers in China. How many DPRK's workers are there in China now? Which industry do they primarily work in? Will the Chinese side consider repatriating them? A: As what I said just now, as a permanent member of the UN Security Council and a responsible member of the international community, the Chinese side will as always implement the resolutions of the UN Security Council in a comprehensive and strict manner and fulfill its international obligations . Q: As for the reasons for not providing the relevant hydrological data to the Indian side mentioned by you, has the Chinese side informed the Indian government of these reasons? A: As far as I know, the Indian side is clear about this. Q: Yesterday, the European branch of the Industrial and Commercial Bank of China (ICBC) was investigated by the Spanish side on suspension of money laundering. What is your comment on this? A: In recent years, the China-Spain and China-Europe relations have witnessed smooth development with the continuous deepening of the pragmatic cooperation in various areas. The Madrid branch and European branch of the ICBC have played a positive role in such areas as promoting the financial cooperation between China and Spain and China and Europe. The Chinese side has always required the Chinese-funded banks to operate in overseas countries in accordance with the local laws and regulations. We hope the Spanish side can properly and justly handle relevant issues in accordance with law and earnestly protect the legitimate rights and interests of the relevant Chinese financial institutions. Q: With regard to the violent attacks in the Rakhine State of Myanmar, as some people accused Myanmar of allegedly conducting ethnic cleansing against the Rohingya Muslims, the UN Security Council will hold a meeting on the situation of the Rakhine State. What is your response to this? A: My colleagues and I have stated our positions on the issue of Rakhine State of Myanmar many times. The Chinese side condemns the violent attacks that happened in the Rakhine State of Myanmar, supports Myanmar's efforts to safeguard the peace and stability of the Rakhine State and sincerely hopes that the Rakhine State can restore stability as soon as possible and the local people can live a normal life again. Meanwhile, we believe that the international community should support the efforts made by Myanmar to maintain national development and stability and create enabling external conditions for the proper settlement of the issue of Rakhine State. The Chinese side has stated relevant positions on multiple international occasions including in the United Nations and we stand ready to continue maintaining communication with all relevant parties on this issue. Q: Yesterday I raised a question about the restrictions placed by some Chinese banks on the DPRK citizens and companies. Do you have any further information now? How do these banks operate? Which type of account is restricted? A: Yesterday I have answered your question and I do not have further information to offer to you. Due to scheduling reasons, the regular press conference of the Foreign Ministry on September 13 (Wednesday) will be held at 2:00 p.m. at the same venue.